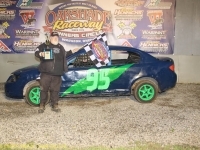 Despite the threatening skies and rain all around the area, Oakshade Raceway managed to stay ahead of Mother Nature and get a complete show in for Wallace Racing Products Night which was highlighted by Rusty Schlenk’s second UMP Late Model feature win of the season. The UMP Late Model Wallace Racing Products feature started off with a big pile up at the end of the backstretch on the first lap. The hard crash involved Brett Miller, Ryan Missler, Chris Sands and Brad Wade. Once racing resumed after the lengthy clean up, Schlenk pulled out to a big lead from his pole starting position. 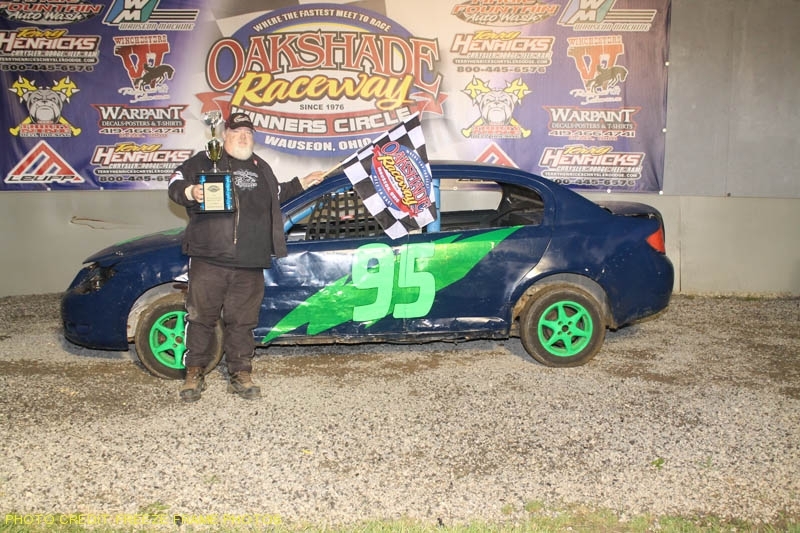 Oakshade point leader Steve Kester was fighting an ill-handling car and all but lost it coming off turn four, sliding sideways down the front stretch toward the infield and somehow managed to save it after losing quite a few positions. Luckily for Kester, the yellow flag came out soon after for a Jimmie Ward Jr. spin which would preserve Kester’s top five position when they lined up for the restart. A few more cautions kept the field somewhat tight behind Schlenk and Brian Ruhlman was able to challenge to the high side of the McClure, Ohio, driver for a couple laps before slipping up and turning second over to Devin Shiels. Schlenk went on to pick up the easy victory and Ky Harper was able to get by Shiels on a late restart to end up second. Kester maintained a fourth place finish behind Shiels and Ruhlman slipped back to finish fifth. 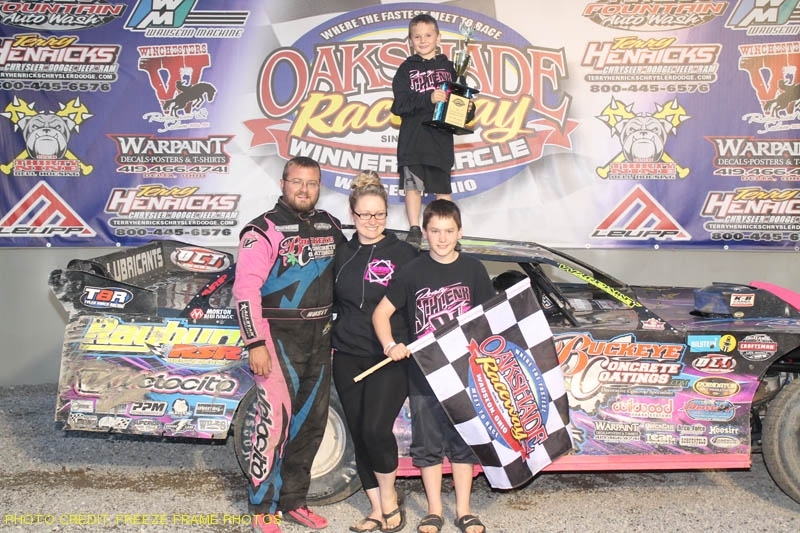 Fresh off his feature win last week, Mathew Chapman wasted no time in grabbing the lead right after the drop of the green flag in the Wallace Racing Products AmeriGas UMP Sportsman feature after starting inside the second row. 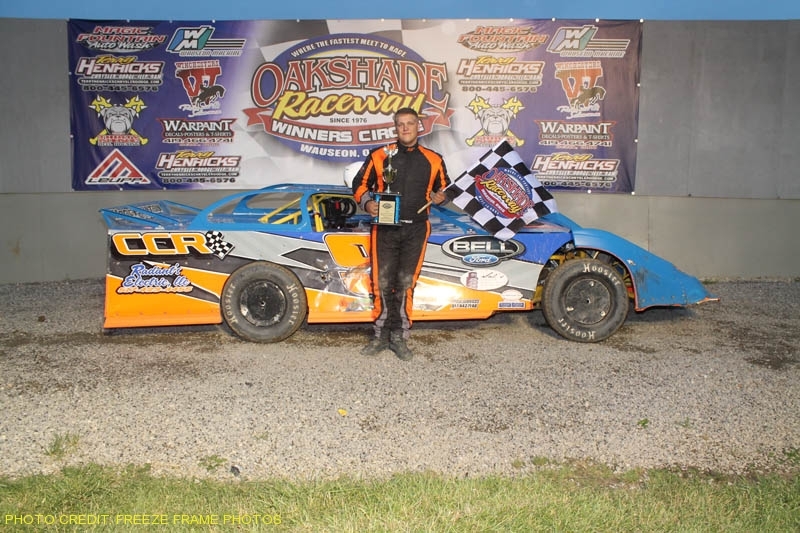 Mike Jessen was chasing Chapman most of the race, but was unable to catch the driver out of Tecumseh, Michigan. Despite no feature wins yet this season, Jessen remains atop the point standings with his second place finish. Rusty Smith finished fourth followed by Tim Fisher and Scott Mills. 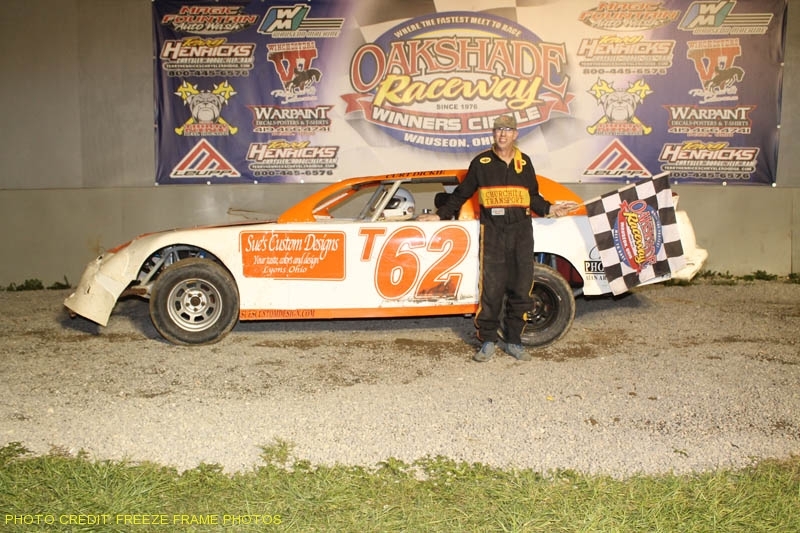 Chris Henry’s first feature start of the season resulted in a win. 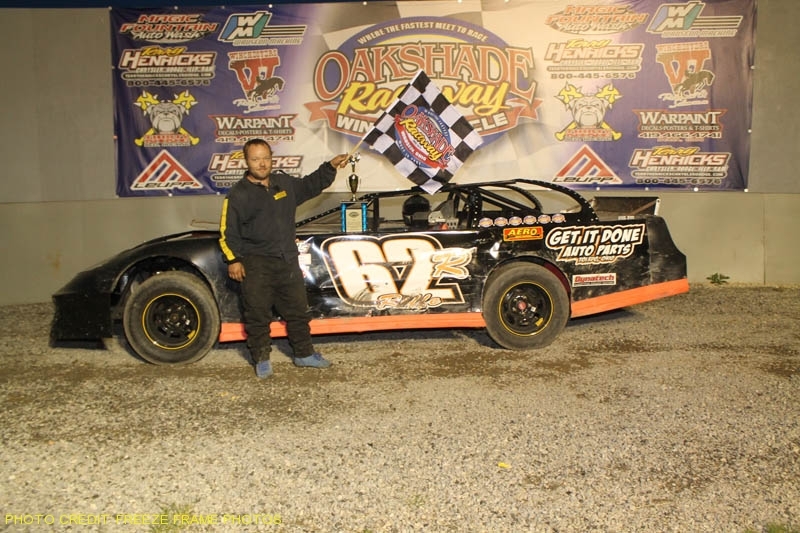 Out of Jackson, Michigan, Henry started on the pole and never looked back in the Wallace Racing Products Hot Rod Welding & Engineering Bomber A Main. Tim Hancock started on the outside of the front row and was able to maintain position for a second place finish. Adam Noonan ended up third and Jeff Foks Jr., who had won all the previous A Mains this season, wound up finishing fourth. Justin Gamber was fifth. Joe Elliott drove from the outside of the front row to a Wallace Racing Products Compact feature win. 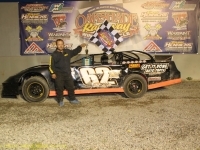 It was a successful night for the Osseo, Michigan, driver who also won his heat event earlier in the night. 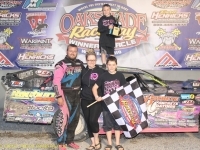 Eric Carr earned a second place finish and after winning the previous two compact features, Cory Gumm settled for third but remains the point leader. Mark Barrick and Cameron Tusing were the rest of the top five finishers. Rich Riffe was involved in a vicious crash at the start of last week’s Hot Rod Welding & Engineering Bomber A Main that resulted in a red flag and a visit with the ambulance staff. 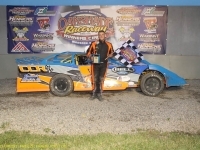 Riffe was able to put that behind him this week, picking up the Wallace Racing Products Hot Rod Welding & Engineering Bomber B Main feature win. 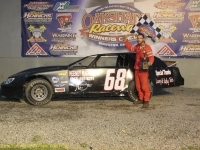 Jake Gamber trailed the Toledo, Ohio, driver most of the race and settled for a second place finish. Cody Stetten started on the pole and slipped back to finish third. Chris Bleikamp and Nathan Hutchison were the rest of the top five finishers. 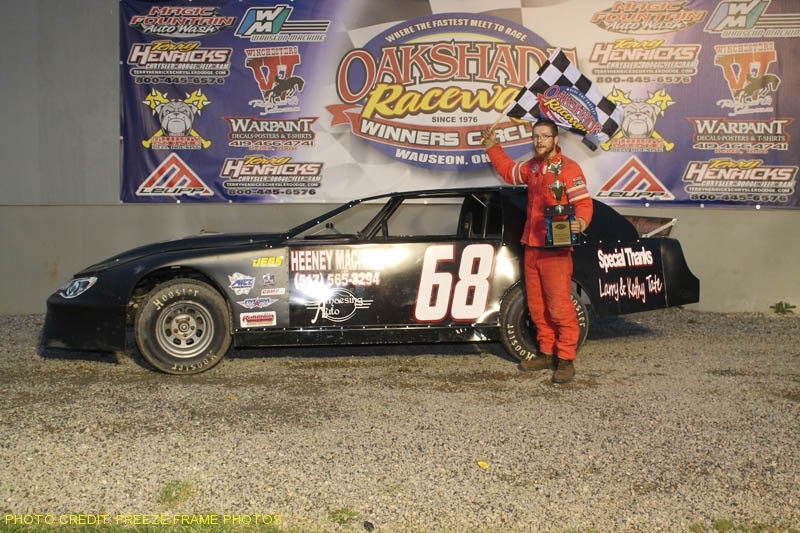 The annual Barney Oldfield Race takes place this Saturday, June 16 at Oakshade Raceway. The event is a Sunoco American Late Model Series event paying $5,400 to win. The AmeriGas UMP Sportsman, Hot Rod Welding & Engineering Bombers and Compacts will also be back in action. Gates open at 4pm, hot laps at 6pm and racing begins at 7pm.